Hi to all of you. I am delighted to be part of this group - have wanted to be part of 12 X 12 group for some time, after watching the work of the original 12 X 12 group develop over the last couple of years. I've been quilting a long time - have tried out all sorts of techniques and subject matter. At this point I would describe myself as a mostly piecer, with a love of improvisational work and saturated colours. 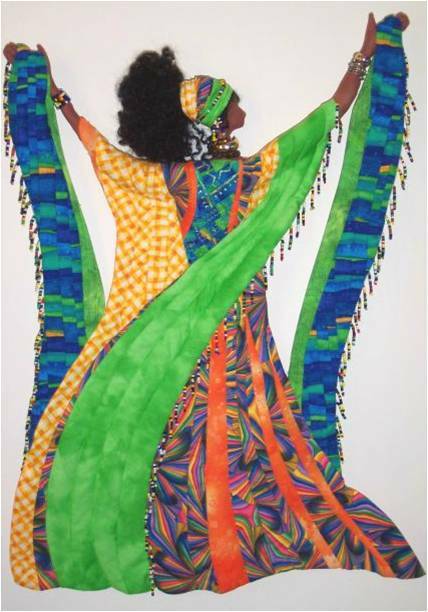 I have a special interest in African textiles and art work. Also in the designs of the Art Deco/Art Nouveau/Arts & Crafts period. I am full of more ideas than I could hope to execute in a life time, but have found that focussing on small work, helps in that process. I look forward to this exchange. A big thank you to Gladys for getting it going! Water Colours - water-colour paper, Pelikan water-colours, beads, metal leaf, hand-made cords, Perfect Pearls, silk dupioni, etc. I was delighted when Gladys invited me to join this group and I am very much looking forward to the challenges and meeting the other members. I am not a professional or trained artist. I used to make most of my own clothing and took courses in pattern drafting. (I thought I wanted to be an architect when I grew up, but found out there was a physics component ... then there was all that math ...!). Anyway, I made several wedding outfits - two of which were from patterns I drafted from scratch) before deciding that I needed to do something more "me". One of my first experiments was with fabric paper - before I knew there was such a thing. At this particular moment, my sewing room has had two coats of fresh paint, the trim is in place, the new laminate flooring is down and the room is completely devoid of anything "art-quilty" (including furniture) because it's spread all over the rest of the house. My husband and I share our home with a Chocolate Lab, three indoor cats and a almost-feral barn cat we had spayed and for whom we bought a $60 heated cat bed. When I originally posted this as an email, my sewing room was virtually non-existent. However, I have now just about finished refilling the room. A rug to go under the desk (so I can spill paint, ink, and glue - and not ruin the new laminate flooring) and a blind will arrive sometime next week. For some reason, we elected NOT to keep the filthy slime-green carpet that was lurking under the not-quite as filthy beige carpet. The slime-green carpet was glued to the subfloor. My husband had to scrape the residue off and nailed a new subfloor over top. Hi my name is Karrie, I am an avid Quilter and knitter. I am seriously addicted to all things fibre. I have a tendency to bounce from technique to technique and as yet have not settled into one particular style. I am excited about participating in this challenge as it feeds this need to try new things. These pieces are "bite sized" since I am not committed to a large piece it makes it easier to try a something new, if I like it I can carry on and make a larger piece. The flip side, if I don't like it I can re-work the piece or move on. This first photo is my most recent work. The Heron is my favorite piece thus far. If I am not quilting or knitting I can usually be found doing yoga, gardening, walking the dog or sitting on the back of our motorcycle. I try very hard to never leave the house without my camera as I am always taking photos to use for inspiration. For those of you who don't know me, I thought I'd say a bit about myself. One year ago I reteired from my job as a secretary at a high school. Almost three years ago I had a book published thru C&T Publishing, "Embellishing with Anything". The plan was to do another book as soon as I retired, but as we all learn, the best laid plans do go astray! My parents ended up having a rough winter health-wise, and are now living with my husband and I. A move from Alberta's ice and snow and dry weather to our pacific coast rain forest! Big changes for Dad who is 97 and Mum is who 83. A new chapter of my life has begun! It's sort of like being a parent again, only with no authority! I love to work with anything textile........have been quilting since 1994 and often say I prefer art quilting because my points don't match! I love mixed media work and I also knit, used to make bobbin lace, can spin wool, altho I don't have a wheel anymore, and I don't like cooking! But....I do love landscaping and gardening! These two pictures are two of my favorite projects to date. 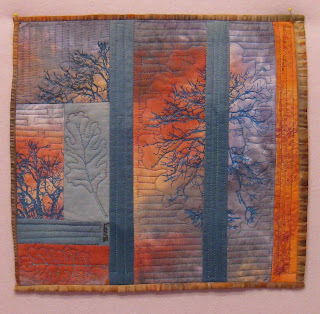 The big wall hanging was juried into the Grand National with the theme "Fantasy", and the wall doll won a Viewer's Choice award in a Trendtex Challenge at CQA. Our home is on Vancouver Island (which helps with the gardening passion) and we share it with one very cranky but loving old cat and a ten year old dog who thinks he is a puppy. it does not seem to put us under pressure. A new blog introducing a group of fibre artists who will partake in themed challenges of a specific size. Expect to see great things happening here: comments, inspiration and photos being the very least! To start, we will be doing 12" x 12" quilts oriented to a chosen theme. The variety of skills held by the participants vary so look for great things to come. First will be introductions posted by each participant. Stay posted.